A week after grabbing attention with the largest remaining fundraising war chest, Dana Kaplan bolstered her campaign for the open District B seat on the New Orleans City Council by announcing endorsements Wednesday from Mayor Mitch Landrieu, U.S. Rep. Cedric Richmond and five other prominent elected officials. Though not frequently in the public eye until launching her bid for the City Council, Kaplan was praised for her work helping craft criminal-justice policy at both the state and city level by her new group of high-profile supporters. Richmond recalled her testimony before the state legislature. “She has a reputation for telling you what you need to hear, not what you want to hear,” Richmond said. 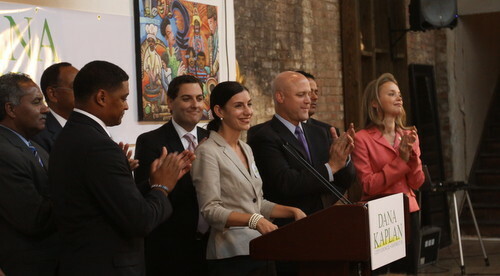 Landrieu described Kaplan as both “tough” and “smart,” two key attributes in a public official, and said her service continues the theme of a New Orleans united for progress beyond surface issues of race or geography. Her experience and expertise give her a strong insight into making progress in New Orleans a reality, Landrieu said. “A lot of people have a lot of advice on the ‘what,’ but they’re really kind of flat on the ‘how,'” Landrieu said. Among the other citywide officials, Assessor Errol Williams praised Kaplan for bringing different groups of people together. Sheriff Marlin Gusman may have illustrated that point, saying that he already knew he wouldn’t always agree with Kaplan, but that he could trust her to study every issue thoroughly. State Rep. Helena Moreno, whose legislative district covers much of the downtown side of District B, said that Kaplan’s extensive knowledge of national best practices for criminal justice will be a “valuable asset” on the City Council. State Rep. Walt Leger touted her work in juvenile justice, representing constituents who don’t have a strong voice for themselves, saying it shows “where her heart is.” And State Rep. Jared Brossett said Kaplan was “outstanding” at making her sure her ideas were heard. “Dana exemplifies the next generation of progressive leadership in governance,” Brossett said. Landrieu and Richmond’s endorsements — which echo their joint conference supporting James Gray in District E several weeks ago — cinch up some of the last remaining undeclared high-profile elected officials. Eric Strachan started early with the support of City Councilwoman Jackie Clarkson, followed by LaToya Cantrell’s endorsements by two City Councilwomen, Kristen Gisleson Palmer and Cynthia Hedge-Morrell and three state lawmakers, Reps. Neil Abramson, J.P. Morrell and Ed Murray. City Councilwoman Stacy Head, the popular but controversial former District B councilwoman whose endorsement might carry the most influence in the crowded field to succeed her, has said she will remain neutral. I thought Strachan had raised the most money and Kaplan was padded with loans from herself? nope, not by loans from herself. she is the personally poorest one of the top 3. You can see here that Kaplan’s campaign is funded by loans from herself and her family and donations outside the state of Louisiana. Wrong. Latoya has the least amount of money. Dana has been receiving a lot of union money, and Strachan has been sourcing money from mostly in town donors. Yes Latoya has not been able to raise money. But she has the most personal household income. Or did until her husband lost his job for bringing pot to work. Eric comes from money and built more money connections through Stacy and Jackie. I said Dana was the personally poorest one, not that she is poor at all. She just didn’t start this race with the same kind of financial resources that the others had. Yet she was still able to raise the most money. Interesting. Helena Mareno was backed by BOLD, who is supporting Latoya Cantrel. Walt Leger is best buds with Karen Carter Peterson, who IS BOLD. A deal has been cut. It says on her website she is a “proven reformer”. So how can someone who gets the endorsement of the same old guard like Mitch Landrieu, Cedric Richmond (a.k.a protege of William Jefferson), Sheriff Martin Gusman, Enroll Williams, BOLD, etc…, be a reformer? Now, most, including me, don’t know much about anyone running as they are all new, but when you get an endorsement from the same old guard, what should one expect? I am thinking Strachan was, I think, Stacy Head’s Chief of Staff, so he can’t be that bad and could be similar to Stacy Head if elected and would stand up to corruption just like Stacy Head did at City Hall. As for LaToya Cantrell, well if she can’t tell that her husband is a pothead as well as stand up to him and let him know that he needed to change and get off drugs long before he got caught with a joint in criminal court, then how can she stand up to corruption in politics? Those in the counseling world would call her an “enabler” to her husband’s dangerous behavior. Are these community organizers also “enablers”? Wasn’t President Barack Obama a community organizer? And isn’t there more people on Food Stamps since Obama took office? New Orleans certainly doesn’t need more people/drug addicts on Food Stamps. Just look at the Gert Town and one reason the crime there is the worst in the city is because of government Section 8 (and anything subsidized) housing and EBT as well as housing the “disabled”. The government now uses the word, “disabled” to refer to “ADDICTS” which are housed in the apartment complexes and houses in Gert Town and along Tulane Ave.
You can see these addicts/homeless at the major gas stations on South Carrollton Ave & Washington and South Carrollton Ave & Olive St. and others down South Carrollton Ave near Willow and St. Charles Ave buying 24oz beer (in a brown paper bag so you and me don’t know they are drinking at 10am in the morning). Or (2) passed out just outside the gas station at 1pm in the afternoon in the hot sun, or (3) on the street corner bleeding from a gunshot wound, or, (4) as usual, with their “Will work for food” sign at all intersections I just mentioned while the NOPD just drive on by. Yes, the Mayor wants to put the city’s best foot forward during special events by getting rid of the homeless/addicts 15 days out of the year, but for the other 350 days of the year, it’s OK to have New Orleans looking like a garbage dump (or 30 year too long frat party) with the homeless/addicts at all the major intersections. Is it any wonder why all the companies have left New Orleans for Jefferson, St. Tammany or outside Louisiana? For me yes, but apparently not to the Tourism Officials of Louisiana and New Orleans who have no clue on how business works nor have any businesses left to show for all their so called expertise. respectfully, bold is backing latoya, not dana. they also backed stacy in every race she has been in. where did you get your info? How is Eric not old guard? He worked for Clarkson, the oldest guard there is! “handcuffed” in the journalistic sense, of course…. All the candidates run paid advertising in the messenger. It does not mean they cannot be objective! MM- look into who is paying Danae Columbus. I think the fact that Dana has received such a wide breadth of support speaks to her ability to bring people together which is EXACTLY what this districts needs. For too long we were dogged in divisive politics- we need someone who has support from Uptown to Central City. People are even willing to go outside of their political machines to back Dana. It is so refreshing and exciting to have a real consensus candidate who will work to get things done and create positive change. Its a clear choice for me- especially after seeing how intelligent Dana came off in the debate. Berkeley, Juvenile Justice, endorsed by SEIU, AFL-CIO, & Teamsters. Sounds like an extreme leftist to me. God help us. Wonder if these pols just play the Dem card to get along or really believe that socialist crap.